Probably one of the best ways to stay in debt is to take out a loan against the money that you make. Payday loan companies make it sound so easy and convenient, but there is definitely a price to pay for easy money right at your fingertips. These lenders are a one way ticket on the merry-go-round of never-ending insolvency. Sometimes the merry-go-round will stop long enough for you to apply for an extension, but then it keeps on going around and around. Payday lenders make a large amount of their money by keeping their borrowers renewing or extending loans with excessive fees and high interest rates. Typical Payday Customer. Normally, the type of person who chooses to take out a payday loan does not save their money for a “rainy day” so to speak in an emergency fund. Therefore, when they are faced with an unexpected cost, such as a car repair or medical payment, they find themselves desperately seeking a solution through unreliable means, such as payday loan companies or credit card advances. Needless to say, you can find many payday loan companies on the Internet who offer a “quick fix” when you are caught in a financial jam. However, you need to be aware of the consequences of leaning on such a lender when you are experiencing a small financial crisis. License To Steal. Once you sign on the dotted line of the application with a payday lender, you pretty much have given the company a license to take all the money you make as well as any you have yet to make for a long, long time. You are especially vulnerable if you do not have any money put away in savings or you are already carrying a good amount of debt. 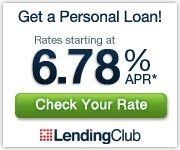 These lenders charge interest rates in two week periods which make the interest rate incredibly high on an annual basis. So, borrowers can find it difficult to pay back the money they have borrowed in addition to the excessive interest and fees. As a result, they are often forced to obtain an extension, which further exacerbates the situation. Now they are in even deeper debt, with dwindling hope of paying the lender as they usually have nothing in savings and have too many outstanding balances to pay down the current installment. Other Options. There are a few options that you may want to consider instead of borrowing money against your paycheck from a payday lender. While I do not recommend that you loan money from family members, it might be a better deal for you financially to borrow from them instead of getting money through a predatory lender. You can also find that peer-to-peer lending through websites such as Lending Club may provide you with a better long term option from money. You can skip borrowing from a bank and us Lending Club to borrow directly from investors who are looking for a great interest rate in return. You should also consider selling some of your stuff to a pawn shop, eBay, or Half.com in order take raise money for whatever need you are facing. Therefore, be sure you carefully scrutinize a loan contract carefully. Predatory lenders target people who are not knowledgeable about finance and elderly people caught in desperate situations. Therefore, do all you can to educate yourself about saving, staying clear of debt and reading the fine print. Learn to save for a rainy day with an emergency fund.